From Singapore: Silk Air operates regular flights from Singapore to Manado. From Manado to Sorong regular flights are offered by Lion Air and Merpati. It is easiest to check with a local Indonesian Travel agent or directly with the airline for the latest domestic flights available. To access the diving spots, the visitors can contact and use the professional diving organizers in Sorong. 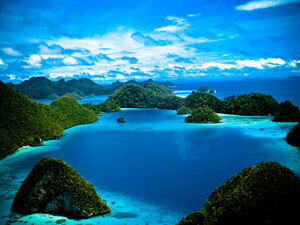 Before going to the dive spots, the visitors need to obtain a permit from the local Papua police station. Hence, the visitors need to bring the passport and three (3) copies of the passport page with the Indonesian Visa. The diving organizers will help with these formalities. From Sorong, there are two type of boats available; Speed Boat (40 minutes - 1 hour boat trip, carries 15 passengers); Long Boat (2-3 hour boat trip and could carry 10 passengers). The boats can also be rent to getting around the islands.